I recently had the opportunity to model for Koco Blaq, a fashion line by designer, and celebrity Hollywood stylist Daniel Terrell. You might know Koco Blaq for it’s luxurious high-end resort wear for both women and men. Quality, sophistication, fit and flare are highlights of this brand. I am a curvy doll with G cups who adores the Tiki Oasis lifestyle and Koco Blaq makes it effortless as sizes range from Small to 2XL leaving you feeling incredibly beautiful and confident in these gorgeous clothes as they not only hug your curves in all the right places, but they are made from a super comfy scuba stretchy fabric so they will keep there shape and are truly flattering on many body types. I am wearing Koco Blaq’s Mele Palm Ruffle Dress here in the opening photo and the colors are stunning, no doubt it’s a show stopper, get ready for heads to turn!! The only accessories you’ll need are some vintage Bakelite bangles and your favorite Tiki hair flower. 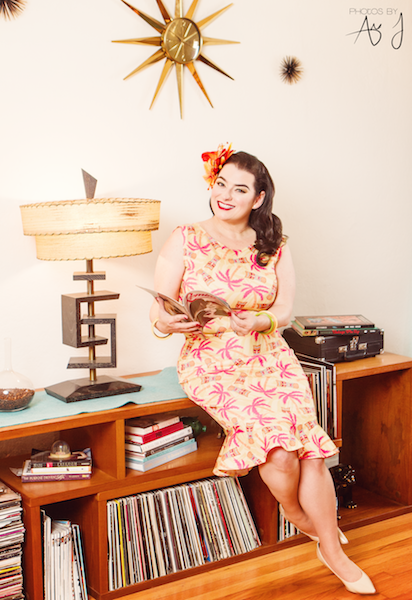 This fabulous Tiki set is the Blaq Tea Leaf skirt and matching top. This outfit is a must for any Pinup Rockabilly doll as it is a high waisted circle skirt and the top has a collar and ties in the front so you can be as vavavoomy as you want plus, the top is the perfect length in back covering nicely. Wear the skirt with your favorite petticoat for a little added volume and you will receive nothing but compliments. This outfit too is made from the same super comfy scuba stretchy fabric so it will keep its shape and is truly flattering on many body types. Sizes range from Small to 2XL. You will love this one! !